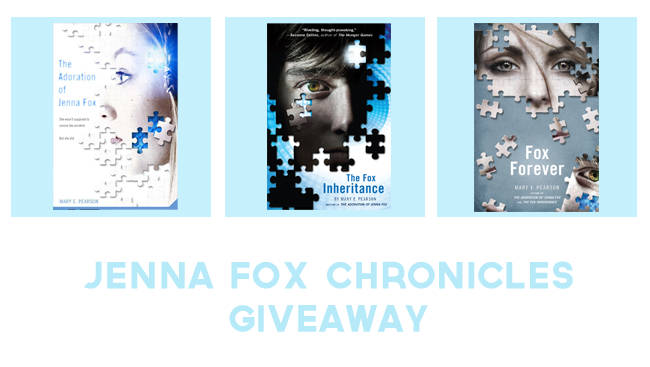 I loved, loved Fox Inheritance (and the whole Jenna Fox Chronicles) so of course I jumped on the chance to be a part of the Fox Forever blog tour. You can find my review of it here. Q: I just read an article in Time magazine about how scientists, researchers and a TV production company created a bionic man with among other things: plastic blood, full-service heart and sight-restoring eyes. It looks like our world is getting closer to a world resembles the world of Jenna Fox Chronicles. Do you think any of the characters or events from the Jenna Fox Chronicles will have a real-life counterpart? Absolutely. Just this past fall there was a big story on the news about a man who climbed a skyscraper with his bionic leg—much like the ones that I gave to Allys in the story— limbs where you can “think” them to move. It works in synchronicity with the brain. There’s just about no part of the human anatomy that can’t be recreated in the lab—including the eyes you mentioned! We have a ways to go to master some of these advances, but I think it’s only a matter of time before we’re able to put it all together. The brain and how it works is still a bit of a question though. They’ve created prosthesis’ for parts of the brain to restore certain functions, but the mind is still a mystery. Is it only pieces of information? Or do all these pieces of information stored in the brain create an energy of their own that we can’t necessarily see? Computers can certainly "think" already. Heck, I'm always battling mine because it thinks it knows better than me on a lot of things--which it probably does. But the constant pieces of information that come to us as humans--sounds, sight, touch, taste, smell--even senses we may not know about yet like sixth, seventh, and even eighth senses, they all affect our perceptions, and play into this five pound mass of white stuff we carry inside our skulls. It's going to take more than a gifted programmer to recreate that. But 260 years ago, who would have guessed that we'd be able to transplant a human heart into someone else? My philosophy is never say never. As far as events go, I think many could happen. Sadly, with the political polarization in our country continuing to escalate, I could see a time in the future of another Civil War. On that count, I do hope I’m wrong. Come on people, let’s get it together! Thanks for having me as a guest on your blog, Alice! I hope your readers enjoy Fox Forever and the other books in The Jenna Fox Chronicles trilogy! Thank you so much to Mary Pearson and Macmillan Books! 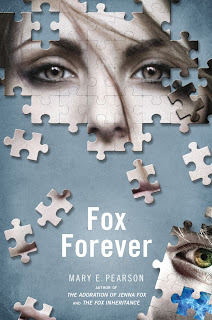 Fox Forever comes out March 19th, 2013. Go, go, go pre-order it! Also, I have a giveaway for US/Canada for one paperback copy of The Adoration of Jenna Fox, one paperback copy of The Fox Inheritance, and one hardcover copy of Fox Forever. That's the WHOLE trilogy! I love the Jenna Fox books! I can't wait to read Fox Forever and see what happens next. The advances in science and healing people are really interesting. Makes me wonder what things will look like in the future. Thanks for the interesting interview and the contest! I would not have a bionic version of myself made because I don't want it to get mad and kill me for bringing it into a cold harsh world that sees it as less than human. Noo. I think two of me is too much to handle. I've wondered about the pros and cons of having a copy of myself before. I think that, ultimately, despite the many benefits possible--ability to do more things, make different choices and see where they lead--I can hardly deal with one of myself, and I don't think it's worth it for the world or me to have two of myself. Hmmm...I don't think I would. If I knew someone that has a digital copy of themselves I would ask them how it is to have a copy of themselves. And I would want to know the pros and cons about having a copy. Then maybe, just maybe if there are some really good things about having a copy then I might want to have a copy of myself.